Summary: How have recent changes in U.S. family structure affected the cognitive, social, and emotional well-being of the nation's children? Paul Amato examines the effects of family formation on children and evaluates whether current marriage-promotion programs are likely to meet children's needs. Amato begins by investigating how children in households with both biological parents differ from children in households with only one biological parent. He shows that children growing up with two continuously married parents are less likely to experience a wide range of cognitive, emotional, and social problems, not only during childhood but also in adulthood. Although it is not possible to demonstrate that family structure causes these differences, studies using a variety of sophisticated statistical methods suggest that this is the case. Amato then asks what accounts for the differences between these two groups of children. He shows that compared with other children, those who grow up in stable, two-parent families have a higher standard of living, receive more effective parenting, experience more cooperative co-parenting, are emotionally closer to both parents, and are subjected to fewer stressful events and circumstances. Finally, Amato assesses how current marriage-promotion policies will affect the well-being of children. He finds that interventions that increase the share of children who grow up with both parents would improve the overall well-being of U.S. children only modestly, because children's social or emotional problems have many causes, of which family structure is but one. But interventions that lower only modestly the overall share of U.S. children experiencing various problems could nevertheless lower substantially the number of children experiencing them. Even a small decline in percentages, when multiplied by the many children in the population, is a substantial social benefit. Perhaps the most profound change in the American family over the past four decades has been the decline in the share of children growing up in households with both biological parents. Because many social scientists, policymakers, and members of the general public believe that a two-parent household is the optimal setting for children's development, the decline in such households has generated widespread concern about the well-being of American children. This concern has generated interest among policymakers in programs and interventions to increase the share of children growing up in stable, two-parent families. Not everyone, however, agrees with these policies; many observers believe that it is either inappropriate, or futile, for government to attempt to affect children's family structures. My goal in this article is to inform this debate by addressing three questions. First, how do children in households with only one biological parent differ in terms of their cognitive, social, and emotional well-being from children in households with both biological parents? Second, what accounts for the observed differences between these two groups of children? And finally, how might current policies to strengthen marriage, decrease divorce, and lower nonmarital fertility affect the wellbeing of children in the United States? The rise in the divorce rate during the 1960s and 1970s prompted social scientists to investigate how differing family structures affect children. Their research focus initially was on children of divorced parents, but it expanded to include out-of-wedlock children and those in other nontraditional family structures. In 1991, Bruce Keith and I published the first meta-analysis dealing with the effects of divorce on children.5 Our analysis summarized the results of ninety-three studies published in the 1960s, 1970s, and 1980s and confirmed that children with divorced parents are worse off than those with continuously married parents on measures of academic success (school grades, scores on standardized achievement tests), conduct (behavior problems, aggression), psychological well-being (depression, distress symptoms), self-esteem (positive feelings about oneself, perceptions of self-efficacy), and peer relations (number of close friends, social support from peers), on average. Moreover, children in divorced families tend to have weaker emotional bonds with mothers and fathers than do their peers in two-parent families. These results supported the conclusion that the rise in divorce had lowered the average level of child well-being. Our meta-analysis also indicated, however, that the estimated effects of parental divorce on children's well-being are modest rather than strong. We concluded that these modest differences reflect widely varying experiences within both groups of children. Some children growing up with continuously married parents are exposed to stressful circumstances, such as poverty, serious conflict between parents, violence, inept parenting, and mental illness or substance abuse, that increase the risk of child maladjustment. Correspondingly, some children with divorced parents cope well, perhaps because their parents are able to separate amicably and engage in cooperative co-parenting following marital dissolution. In a more recent meta-analysis, based on sixty-seven studies conducted during the 1990s, I again found that children with divorced parents, on average, scored significantly lower on various measures of wellbeing than did children with continuously married parents.6 As before, the differences between the two groups were modest rather than large. Nevertheless, the more recent meta-analyses revealed that children with divorced parents continued to have lower average levels of cognitive, social, and emotional well-being, even in a decade in which divorce had become common and widely accepted. Other studies have shown that the differences in well-being between children with divorced and children with continuously married parents persist well into adulthood. For example, adults who experience parental divorce as a child have lower socioeconomic attainment, an increased risk of having a nonmarital birth, weaker bonds with parents, lower psychological well-being, poorer marital quality, and an elevated risk of seeing their own marriage end in divorce.7 Overall, the evidence is consistent that parental divorce during childhood is linked with a wide range of problems in adulthood. Although it is sometimes assumed that children born to unwed mothers have little contact with their fathers, about 40 percent of unmarried mothers are living with the child's father at the time of birth.11 If one-third of all children are born to unmarried parents, and if 40 percent of these parents are cohabiting, then about one out of every eight infants lives with two biological but unmarried parents. Structurally, these households are similar to households with two married parents. And young children are unlikely to be aware of their parents' marital status. Nevertheless, cohabiting parents tend to be more disadvantaged than married parents. They have less education, earn less income, report poorer relationship quality, and experience more mental health problems.12 These considerations suggest that children living with cohabiting biological parents may be worse off, in some respects, than children living with two married biological parents. Consistent with this assumption, Susan L. Brown found that children living with cohabiting biological parents, compared with children living with continuously married parents, had more behavioral problems, more emotional problems, and lower levels of school engagement (that is, caring about school and doing homework).13 Parents' education, income, psychological well-being, and parenting stress explained most-–but not all-“Of these differences. In other words, unmarried cohabiting parents, compared with married parents, had fewer years of education, earned less income, had lower levels of psychological well-being, and reported more stress in parenting. These factors, in turn, partly accounted for the elevated number of problems among their children. Unresolved questions remain about children born to cohabiting parents who later marry. If cohabiting parents marry after the birth of a child, is the child at any greater risk than if the parents marry before having the child? Correspondingly, do children benefit when their cohabiting parents get married? To the extent that marriage increases union stability and binds fathers more strongly to their children, marriage among cohabiting parents may improve children's long-term well-being. Few studies, however, have addressed this issue. Some children live with a single parent not because of divorce or because they were born outside marriage but because their other parent has died. Studies that compare children who experienced the death of a parent with children separated from a parent for other reasons yield mixed results. The Amato and Keith meta-analysis found that children who experienced a parent's death scored lower on several forms of well-being than did children living with continuously married parents. Children who experienced a parent's death, however, scored significantly higher on several measures of well-being than did children with divorced parents.19 McLanahan and Sandefur found that children with a deceased parent were no more likely than children with continuously married parents to drop out of high school. Daughters with a deceased parent, however, were more likely than teenagers living with both parents to have a nonmarital birth.20 Another study found that although adults whose parents divorced or never married during their childhood had lower levels of socioeconomic attainment than did adults who grew up with continuously married parents, adults who experienced the death of a parent as a child did not differ from those with two continuously married parents.21 In contrast, Amato found that all causes of separation from a parent during childhood, including parental death, were linked with increased symptoms of depression in adulthood.22 Although the research findings are mixed, these studies suggest that experiencing the death of a parent during childhood puts children at risk for a number of problems, but not as much as does divorce or out-of-wedlock birth. Although rates of remarriage have declined in recent years, most divorced parents eventually remarry. Similarly, many women who have had a nonmarital birth eventually marry men who are not the fathers of their children. Adding a stepfather to the household usually improves children's standard of living. Moreover, in a stepfamily, two adults are available to monitor children's behavior, provide supervision, and assist children with everyday problems. For these reasons, one might assume that children generally are better off in stepfamilies than in single-parent households. Studies consistently indicate, however, that children in stepfamilies exhibit more problems than do children with continuously married parents and about the same number of problems as do children with single parents.26 In other words, the marriage of a single parent (to someone other than the child's biological parent) does not appear to improve the functioning of most children. Although the great majority of parents view the formation of a stepfamily positively, children tend to be less enthusiastic. Stepfamily formation is stressful for many children because it often involves moving (generally to a different neighborhood or town), adapting to new people in the household, and learning new rules and routines. Moreover, early relationships between stepparents and stepchildren are often tense. Children, especially adolescents, become accustomed to a substantial degree of autonomy in single-parent households. They may resent the monitoring and supervision by stepparents and react with hostility when stepparents attempt to exert authority. Some children experience loyalty conflicts and fear that becoming emotionally close to a stepparent implies betraying the nonresident biological parent. Some become jealous because they must share parental time and attention with the stepparent. And for some children, remarriage ends any lingering hopes that the two biological parents will one day reconcile.27 Finally, stepchildren are overrepresented in official reports of child abuse.28 Of course, the great majority of stepparents are not abusive. Moreover, survey data have not supported the notion that children in stepfamilies are more likely to be abused than are children in two-parent families. 29 Nevertheless, even a slight trend in this direction would represent an additional risk for children in stepfamilies. The increase in nonmarital cohabitation has focused attention on the distinction between married-couple stepfamilies and cohabiting-couple "stepfamilies." Christine Buchanan, Eleanor Maccoby, and Sanford Dornbusch found that adolescents had fewer emotional and behavior problems following divorce if their mothers remarried than if they cohabited with a partner.31 Similarly, two studies of African American families found that children were better off in certain respects if they lived with stepfathers than with their mother's cohabiting partners.32 In contrast, Susan Brown found no significant differences between children in married and cohabiting stepfamilies.33 Although these data suggest that children may be better off if single mothers marry their partners rather than cohabit, the small number of studies on this topic makes it difficult to draw firm conclusions. Several early influential studies found that boys in divorced families had more adjustment problems than did girls.34 Given that boys usually live with their mothers following family disruption, the loss of contact with the same-gender parent could account for such a difference. In addition boys, compared with girls, may be exposed to more conflict, receive less support from parents and others (because they are believed to be tougher), and be picked on more by custodial mothers (because sons may resemble their fathers). Subsequent studies, however, have failed to find consistent gender differences in children's reactions to divorce. The meta-analyses on children of divorce provide the most reliable evidence on this topic. The Amato and Keith meta-analysis of studies conducted before the 1990s revealed one significant gender difference: the estimated negative effect of divorce on social adjustment was stronger for boys than girls. In other areas, however, such as academic achievement, conduct, and psychological adjustment, no differences between boys and girls were apparent.35 In my meta-analysis of studies conducted in the 1990s, the estimated effect of divorce on children's conduct problems was stronger for boys than for girls, although no other gender differences were apparent.36 Why the earlier studies suggest a gender difference in social adjustment and the more recent studies suggest a gender difference in conduct problems is unclear. Nevertheless, taken together, these meta-analyses provide some limited support for the notion that boys are more susceptible than girls to the detrimental consequences of divorce. Some studies suggest that stepfathers play a particularly beneficial role in African American families. One study found that in African American families (but not European American families), children who lived with stepfathers were less likely to drop out of high school or (among daughters) have a nonmarital birth.41 Similarly, a study of African Americans living in high-poverty neighborhoods found that girls living with their mothers and stepfathers were less likely than girls living with single mothers to become sexually active or pregnant. Interestingly, the protective effect of a stepfather held only when mothers were married and not when they were cohabiting.42 Another study yielded comparable results: among African Americans, adolescents living with stepfathers were better off in many respects than were adolescents living with single mothers, but adolescents living with cohabiting parents were worse off than those living with single mothers.43 The reasons for these racial differences are not clear, and future research is required to understand how interpersonal dynamics differ in white and African American stepfamilies. Why do single-parent families put children at risk? Researchers have several theories to explain why children growing up with single parents have an elevated risk of experiencing cognitive, social, and emotional problems. Most refer either to the economic and parental resources available to children or to the stressful events and circumstances to which these children must adapt. Explanations that focus on economic hardship, the quality of parenting, and exposure to stress all assume that the circumstances associated with living in a single-parent household negatively affect children's well-being. A quite different explanation-–and the main alternative to these views-–is that many poorly adjusted individuals either never marry in the first place or see their marriages end in divorce. In other words, these people carry traits that "select" them into single parenthood. Parents can transmit these problematic traits to their children either through genetic inheritance or inept parenting. For example, a mother with an antisocial personality may pass this genetic predisposition to her children. Her personality also may contribute to her marriage's ending in divorce. Her children will thus be at risk of exhibiting antisocial behavior, but the risk has little to do with the divorce. The discovery that concordance (similarity between siblings) for divorce among adults is higher among identical than fraternal twins suggests that genes may predispose some people to engage in behaviors that increase the risk of divorce.58 If parents' personality traits and other genetically transmitted predispositions are causes of single parenthood as well as childhood problems, then the apparent effects on children of growing up with a single parent are spurious. Because researchers cannot conduct a true experiment and randomly allocate children to live with single or married parents, it is difficult to rule out the selection perspective. Nevertheless, many studies cast doubt on it. For example, some have found significant differences between children with divorced and continuously married parents even after controlling for personality traits such as depression and antisocial behavior in parents.59 Others have found higher rates of problems among children with single parents, using statistical methods that adjust for unmeasured variables that, in principle, should include parents' personality traits as well as many genetic influences.60 And a few studies have found that the link between parental divorce and children's problems is similar for adopted and biological children” a finding that cannot be explained by genetic transmission.61 Another study, based on a large sample of twins, found that growing up in a single-parent family predicted depression in adulthood even with genetic resemblance controlled statistically.62 Although some degree of selection still may be operating, the weight of the evidence strongly suggests that growing up without two biological parents in the home increases children's risk of a variety of cognitive, emotional, and social problems. Since social science research shows so clearly the advantages enjoyed by children raised by continuously married parents, it is no wonder that policymakers and practitioners are interested in programs to strengthen marriage and increase the proportion of children who grow up in such families. Realistically speaking, what could such programs accomplish? In what follows, I present estimates of how they could affect the share of children in the United States who experience various types of problems during adolescence. Responses are shown separately for adolescents living with continuously married parents and for those living with one parent only. The results are striking. Adolescents living with single parents consistently report encountering more problems than those living with continuously married parents. Thirty percent of the former reported that they had repeated a grade, as against 19 percent of the latter. Similarly, 40 percent of children living with single parents reported having been suspended from school, compared with 21 percent of children living with continuously married parents. Children in stable, two-parent families also were less likely to have engaged in delinquency or violence, seen a therapist for an emotional problem, smoked during the previous month, or thought about or attempted suicide. These findings are consistent with research demonstrating that children living with continuously married parents report fewer problems than do other children. The increase in risk associated with living without both parents ranged from about 23 percent (for being involved in a violent altercation) to 127 percent (for receiving emotional therapy). Column four shows that if the share of adolescents living with two biological parents were the same today as it was in 1980, the share of adolescents repeating a grade would fall from 24 percent to about 23 percent. Similarly, if the share of adolescents living with two biological parents returned to its 1970 level, the share of adolescents repeating a grade would fall to about 22 percent. Finally, if the share of adolescents living with two biological parents increased to its 1960 level, the share of adolescents repeating a grade would fall to 21 percent. How is it that increasing the share of children growing up with continuously married parents has such a relatively small effect on the share of children experiencing these problems? The explanation is that many children living with continuously married parents also experience these problems. In general, these findings, which are likely to disappoint some readers, are consistent with a broad, sociological understanding of human behavior. Most behaviors are determined by numerous social, cultural, individual, and biological factors. No single variable, such as family structure, has a monolithic effect on children's development and behavior. 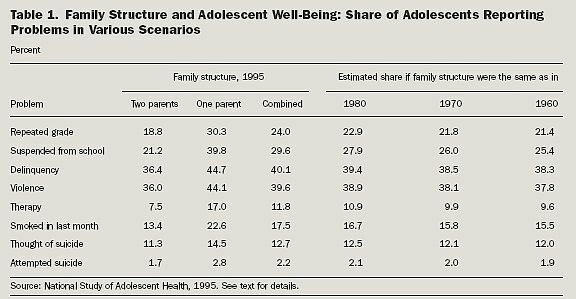 Although increasing the share of children growing up in stable, two-parent families would lower the incidence of all the problems shown in table 1, clearly it is not a panacea for the problems confronting our nation's youth. The cholesterol example is relevant to understanding the effects of growing up without both parents in the household. The increase in the risk of cardiovascular disease associated with high blood cholesterol is comparable in many respects to the increase in the risk of behavioral, emotional, and academic problems associated with growing up in a single-parent household. For example, the increase in heart attacks associated with high blood cholesterol represents a 75 percent increase in risk–([7 “4]/4) x 100–a figure comparable to the increased risk associated with single parenthood and repeating a grade, being suspended from school, receiving therapy, or attempting suicide. Adopting a public health view and considering the number rather than the percentage of adolescents who might be affected helps put these findings in perspective. In 2002 there were about 29 million children in the United States between the ages of twelve and eighteen–the age range covered in table 1.68 Table 2 indicates that nearly 7 million children in this age group will have repeated a grade. Increasing the share of adolescents living with two biological parents to the 1980 level, as illustrated in the second column of the table, suggests that some 300,000 fewer children would repeat a grade. Correspondingly, increasing the share of adolescents living with two biological parents to the 1970 level, as illustrated in the third column, would mean that 643,264 fewer children would repeat a grade. Finally, increasing the share of adolescents in two-parent families to the 1960 level suggests that nearly three-quarters of a million fewer children would repeat a grade. Similarly, increasing marital stability to its 1980 level would result in nearly half a million fewer children suspended from school, about 200,000 fewer children engaging in delinquency or violence, a quarter of a million fewer children receiving therapy, about a quarter of a million fewer smokers, about 80,000 fewer children thinking about suicide, and about 28,000 fewer children attempting suicide. Seen from this perspective, restoring family stability to levels of a few decades ago could dramatically affect the lives of many children. Moreover, although the estimated decline in the share of children encountering these problems in table 1 is modest, increasing the number of children growing up with both parents would simultaneously improve all these outcomes, as well as many other outcomes not considered in these tables. My goal in this paper has been to inform the marriage debate by addressing three fundamental questions. First, how do children in households with only one biological parent differ from children in households with both biological parents, in terms of their cognitive, social, and emotional well-being? Research clearly demonstrates that children growing up with two continuously married parents are less likely than other children to experience a wide range of cognitive, emotional, and social problems, not only during childhood, but also in adulthood. Although it is not possible to demonstrate that family structure is the cause of these differences, studies that have used a variety of sophisticated statistical methods, including controls for genetic factors, suggest that this is the case. This distinction is even stronger if we focus on children growing up with two happily married biological parents. Second, what accounts for the observed differences between these two groups of children? Compared with other children, those who grow up in stable, two-parent families have a higher standard of living, receive more effective parenting, experience more cooperative co-parenting, are emotionally closer to both parents (especially fathers), and are subjected to fewer stressful events and circumstances. And third, how might current policies to strengthen marriage, decrease the rate of divorce, and lower nonmarital fertility affect the overall well-being of American children? The projections in tables 1 and 2 suggest that increasing the share of children who grow up with continuously married parents would improve the overall well-being of U.S. children only modestly. The improvements are relatively small because problems such as being suspended from school, engaging in delinquent behavior, and attempting suicide have many causes, with family structure being but one. What are the policy implications of these findings? First, interventions that increase the share of children growing up with two continuously married biological parents will have modest effects on the percentage of U.S. children experiencing various problems, but could have substantial effects on the number of children experiencing them. From a public health perspective, even a modest decline in percentages, when multiplied by the large number of children in the population, represents a substantial social benefit. That children living in stepfamilies do not tend to have better outcomes, on average, than children growing up in single-parent families suggests that interventions to strengthen marital quality and stability would be most profitable if focused on parents in first marriages. Similarly, interventions to strengthen relationships and encourage marriage among cohabiting couples with children would be most profitable if focused on couples with a first child, rather than couples with children from prior relationships. U.S. policymakers also should acknowledge that returning to substantially lower rates of divorce and nonmarital childbearing, although a worthwhile goal, is not realistic, at least in the short term. Although policy interventions may lower the rate of divorce and nonmarital childbearing, many children will continue to grow up with a single parent. This stubborn fact means that policies for improving children's well-being cannot focus exclusively on promoting marriage and strengthening marital stability. These policies must be supplemented by others that improve economic well-being, strengthen parent-child bonds, and ease the stress experienced by children in single-parent and stepparent households. Such programs would provide parent education classes for divorcing parents, increase the minimum wage and the earned income tax credit for poor working parents, establish paternity and increase the payment of child support, and improve the quantity and quality of time that nonresident parents, especially fathers, spend with their children. The importance of increasing the number of children growing up with two happily and continuously married parents and of improving the well-being of children now living in other family structures is self-evident. Children are the innocent victims of their parents' inability to maintain harmonious and stable homes. The importance of effective policies will become even clearer in the near future, as the baby boom generation reaches retirement age. As this happens, our society will become increasingly dependent on the emotional functioning, economic productivity, and leadership of a declining number of young adults. Although it is a clich” to say that children are the future, it has never been as true as it is today. This feature first appeared in The Future of Children, Volume 15 No 2, a publication of The Woodrow Wilson School of Public and International Affairs at Princeton University and The Brookings Institution."